Today I received this blog award from Emma at "Little Gothic Horrors" although it was not for "Dr Blood's Video Vault". I've got lots of those already. 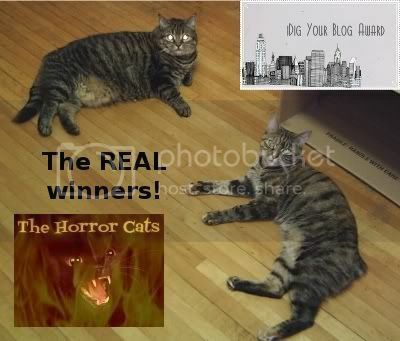 The award has been given to my other blog - "The Horror Cats" - which some of you are more familiar with than others. Just like all the other awards which are getting passed around, it comes with a few obligations which I will now try to fulfil. 1. Gratefully accept this award. 2. Link to the person you received it from. 3. Post 3 interesting facts about yourself. I recently attended a culinary arts program and graduated as "valedictorian" of my class so, among many other things, I am now also a fully trained chef and won't poison myself with my own cooking. For many years I worked as a web developer when it was still quite glamorous and well paid to do so. 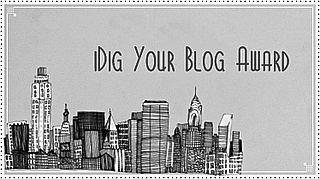 I no longer have the patience with all that coding which is why I use Blogger. 4. Pass this award around to at least 5 blogs you dig. Since I already mentioned a load of them when I got my previous award, I'll choose some different ones this time just to be fair.